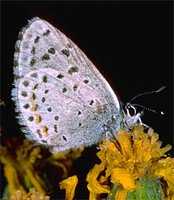 The "true" butterflies are composed of five families - Papilionidae, Pieridae, Nymphalidae, Riodinidae and Lycaenidae. There are estimated to be some 13,700 species extant in the world (Robbins, 1982), distributed on every continent except Antarctica, and most remote oceanic islands as well. The greatest diversity occurs in tropical regions, particularly the neotropics. The hypothesis presented has been repeatedly corroborated by numerous authors (Kristensen 1976, de Jong et al. 1996, Ackery et al. 1999, Wahlberg et al. 2005). Campbell, D. L., A. V. Z. Brower, and N. E. Pierce. 2000. Molecular evolution of the wingless gene and its implications for the phylogenetic placement of the butterfly family Riodinidae (Lepidoptera: Papilionoidea). Molecular Biology and Evolution 17(5):684-696.
de Jong, R., R. I. Vane-Wright, and P. R. Ackery. 1996. The higher classification of butterflies (Lepidoptera): problems and prospects. Entomologica Scandinavica 27(1):65-101. Kristensen N. P. 1976. Remarks on the family-level phylogeny of butterflies (Insecta, Lepidoptera, Rhopalocera). Zeit. Zool. Syst. Evol. 14: 25-33. Paulus, H. F., and H. W. Krenn. 1996. Comparative morphology of the butterfly proboscis and its sensilla - A contribution to the phylogenetic systematics of Papilionoidea (Insecta, Lepidoptera). Journal of Zoological Systematics and Evolutionary Research 34(4):203-216. Robbins R. K. 1982. How many butterfly species? News Lepid. Soc. 1982: 40-41. Butterflies and Moths of North America. Occurrence maps, species accounts, checklists, and photographs. Mariposas Mexicanas: Interactive Listing of Mexican Butterflies. Warren, A. D., J. E. Llorente-Bousquets, A. Luis-Mart?nez & I. Vargas-Fern?ndez. Neotropical Butterflies. A Photo Gallery featuring butterflies from Mexico through Central America to Amazonia and Argentina. Butterflies and Moths of the Netherlands. 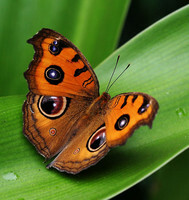 BugGuide.Net: Superfamily Papilionoidea - Butterflies. Identification, Images, & Information For Insects, Spiders & Their Kin For the United States & Canada. Butterflies of Southeastern Arizona. Bruce Walsh, University of Arizona. Butterflies at the Field Museum. The Field Museum, Chicago. The Butterfly Conservatory. Movie clips and live butterfly web cam. American Museum of Natural History, New York. North American Butterfly Association (NABA). A membership-based not-for-profit organization working to increase public enjoyment and conservation of butterflies. Butterfly Conservation. Protecting wild butterflies and their habitats in the UK. Where do butterflies come from?. An activity for children. Howard Hughes Medical Institute. This image is licensed under the Attribution-NoDerivs 2.0 Creative Commons License.